A Czech advert for Podebradka, a brand of flavoured mineral water. Featuring that timeless icon - a cycling girl. April Streeter, a blogger/writer for Treehugger and a good friend of ours has this fine post about the Six Reasons The World Needs More Girls on Bikes. 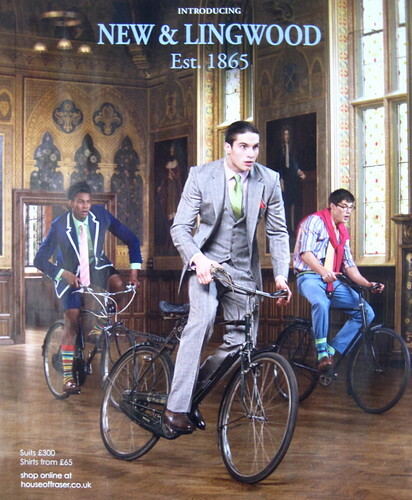 Nothing to do with bicycles, just some well-dressed chappies on them. Having fun, too. Then there's this advert for Killah, as seen on a shop window near me. And the cover of a Japanese bicycle magazine is true Cycle Chic, too. In the supermarket yesterday I saw a Walkers Crisps poster with a chap riding a Pashley Roadster. he was dressed normally and without a skid lid. I couldn't find an on-line version of the poster but here is a video of the TV ad featuring a rather nice looking lady, poster chap and a great work bike parodying the bicycle scene in Butch Cassidy. And not a helmet in sight. Remember that advert with Duffy riding in the supermarket? It was in court today with the advertising standards agency. 18 people had complained on health and safety grounds, as she had no lights on her bike and was not wearing reflective clothing while cycling in the supermarket. Luckily the clever people in charge pointed out that the advertisement was a fantasy, and it was not banned. Apparently no-one noticed the health and safety implications of her cycling in a shop, just her lack of hi-viz clothes. Lucky they focus on the important things in life. The guy in the gray suit looks like Chace Crawford.